How to Remove DRM from iTunes M4V movie with Closed Caption? 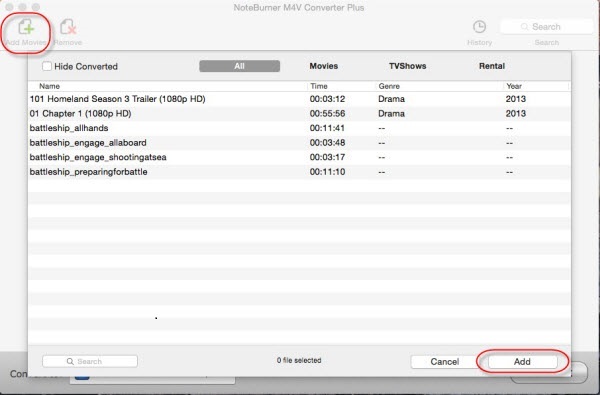 NoteBurner M4V Converter Plus for Mac: Convert DRM M4V movie rentals and purchases on Mac OS X. How can I get the subtitles/closed captions when converting iTunes DRM M4V movies? Recent years, more and more people would like to purchase and enjoy the movie, music and audiobook from iTunes store. But it is still a trouble that iTunes contents have DRM protections which prevent us from transferring them to non-Apple devices for playing. Although most of the music files do not have DRM protections now, the M4V movie files which purchased or rented from iTunes are still DRM-protected. NoteBurner aims to help you solve this problem with the powerful M4V Converter. NoteBurner M4V Converter Plus (For Mac & For Windows) is a great DRM M4V removal for users which help you get rid of the DRM from those iTunes M4V movies and convert them to various video formats such as MP4, MOV, AVI, WMV, FLV, and so on. And many users may want to keep the closed captions of movies, here is a quick guide for you to convert iTunes M4V movie with closed captions or subtitles with NoteBurner M4V Converter Plus. Please download this powerful DRM removal on your Mac or Winodws PC first. Tips: The latest version of NoteBurner M4V Converter Plus can not only preserve multilanguage subtitles and audio tracks of iTunes videos, but also keep AC3 Dolby 5.1 audio track when choosing output as Same as Source for MP4/MOV, which is traditional DRM removal or converter cannot do. It will be perfect to play DRM-free iTunes videos with 5.1 audio track on TV. Step 2: Set output to "Same as Source for MP4/MOV". When you set output to "Same as Source for MP4/MOV", all audio trackes, subtiles and 5.1 audio will be preserved. Conversion speed will be 20X faster than other DRM removals. Click on the Convert button at the bottom to start the conversion. When the conversion done, iTunes movies and TV shows you get are no different from other local video files, but with subtitles preserved! You can transfer them to any devices you have for enjoyment and choose the subtitle track you need for display. Tips: Both Windows version and Mac version of NoteBurner M4V Converter Plus support keeping Closed Captions and Subtitles. YouTube Video On How to Remove iTunes DRM with aSubtitles ( Closed Caption) Kept?